BikePalmBeach.org was created by the Palm Beach TPA to provide a direct connection for users looking specifically for pedestrian and bicycle related information and activities in Palm Beach County. We encourage our local municipalities to organize and participate in local bicycle events. We also encourage municipalities to do their own Florida Bicycle Month Proclamation to celebrate and demonstrate their community's support for bicycling in their communities. Please check out our calendar below for a list of local bicycle events in March 2019. For more questions about what's happening during Florida Bicycle Month throughout Palm Beach County contact the TPA's Bicycle and Pedestrian Coordinator, Nicholas Hernandez, at: (561) 478-5713 or nhernandez@palmbeachtpa.org. For a sample Florida Bicycle Month Proclamation template please click here. Click to view Safety Information. 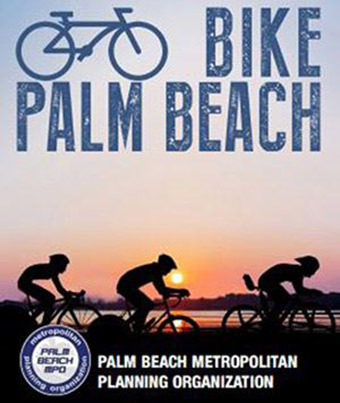 Please use the following form to provide us with information on any upcoming events or activities that you would like to see promoted on the Bike Palm Beach website. Use the link below to attach content such as maps, flyers, logos, etc. Please provide any additional information or brief description of the event/activity. Please attach any supporting information/documentation. Click image to view a calendar of bicycle related meetings, events and activities, including guided tours and competitions. Click individual listings on the calendar for details. The TPA Governing Board approved the new TPA Pedestrian and bicycle Safety Guide at their regularly scheduled meeting of February 16, 2017. The Bike Suitability Map showcases current bicycle facilities on the major roadways and categorizes them as, "Good", "Fair" or "Caution". The reverse side highlights laws and practices for safe cycling in every environment. Background -- The Palm Beach TPA's Bicycle-Trailways-Pedestrian Advisory Committee (BTPAC) is responsible for advising and informing the TPA Governing Board regarding bicycle and pedestrian issues in Palm Beach County. Enactment of the 1984 Florida Bicycle Bill required all county and local municipal governments to give full consideration of the bicycle when planning and developing transportation. Florida became one of the nation's leaders in bicycle planning with the creation of a State Bicycle Office, Bicycle Coordinators in each FDOT District, and Bicycle/Pedestrian Coordinators in a number of counties, including Palm Beach. In Palm Beach County, a bicycle-pedestrian advisory committee was formed in 1987, and later expanded to include greenway issues. Meetings -- Typically, meetings are held the first Thursday of most months. Meetings begin at 9:07 AM and are held in the 4th Floor Conference Room, Room 4E-12, next to the TPA office in the Vista Center at 2300 N. Jog Road, West Palm Beach, FL 33411. 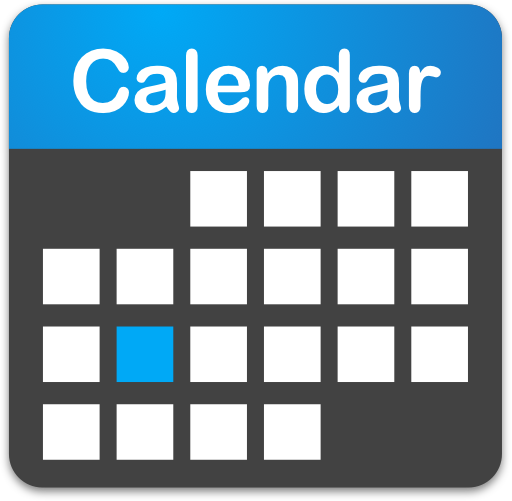 Check the website calendar and the meeting links below for the current meeting schedule. Meeting agendas and backup information are posted in advance of each meeting. Bicycle riding is fun, healthy, and great way to see Palm Beach. This menu provides the most current laws, guides, and tips to learn before you start your ride. Certified traffic cycling instructors demonstrate the rights and duties of cyclists in the United States. The video shows cyclists acting as drivers of vehicles making normal vehicular maneuvers including lane control, lane sharing, left and right turns, through movements and a freeway ramp crossing. It's safest to walk on a sidewalk, but if you must walk in the street, walk facing traffic. At night, increase your visibility by carrying a flashlight and wearing light-colored or reflective clothing. Transit users should cross behind the bus to avoid crashes - drivers cannot see in front of the vehicle if you step out into traffic. Use crosswalks or the nearest intersection to safely cross the street. Stay alert in parking lots or around driveways - drivers may be more focused on their destination and not watching for you. Use a headlight and red rear light or wear reflective clothing that can be seen from 300 feet. Avoid cycling on sidewalks and watch for vehicles turning left or right, and entering or existing parking spaces and driveways - they may be looking for their next move and not see you. Use hand signals to indicate your next move (stop, left turn, right turn). Now you can officially point to the right for right turns instead of relying on a drivers memory to know the other hand signal. In 2016 the Palm Beach TPA completed a Southeast Florida Regional Greenways and Trails Plan that includes an interconnected system of existing and proposed shared use paths, greenways and hiking trail facilities. Click here to view the greenways and trails plan map online. Additional information regarding Palm Beach County Parks with bicycle facilities are listed below. 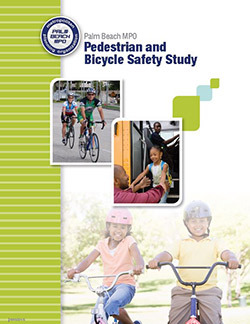 The Palm Beach TPA conducted the Pedestrian and Bicycle Safety Study to formally analyze five years of pedestrian and bicyclist crash data in Palm Beach County and develop evidence based recommendations for safety countermeasures, educational strategies, and performance targets. The final Pedestrian and Bicycle Safety Study was adopted by the TPA Governing Board at their February 2017 meeting. The purpose of this Master Comprehensive Bicycle Transportation Plan is to provide a foundation on which future decisions regarding bicycle transportation will be based, including both long and short range strategies and actions that will most efficiently integrate bicycling into the overall multi-modal transportation system.